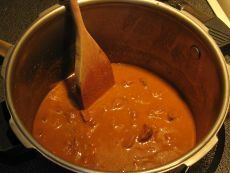 I was given a copy of this easy goulash recipe years ago from someone I worked with. It’s very simple to put together with ingredients you should normally have on hand. Place meat and onion in slow cooker or pressure cooker – your choice – depending on if you’re starting this in the morning or an hour before the meal! 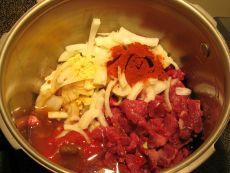 Combine garlic, ketchup, W. sauce, sugar, salt, paprika, and mustard with the water. Stir and pour over meat. (Or just put all of the ingredients in your pot and stir like we do!) 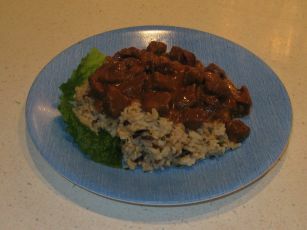 Cover and cook on low in the slow cooker for 9-10 hours or in pressure cooker for 8 minutes. 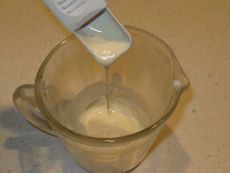 Once cooked, thicken with 2 T. flour mixed in a ¼ c. of water if desired as shown below. 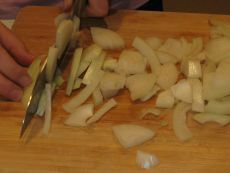 Serve over noodles, rice or potatoes. At the table, we each add a few frozen peas to cool it off enough to dig in!